*Corresponding author. Papers have been cited for more than 4,000 times; average citation = 6.939 times/yr/paper for papers published as *corresponding author; average citation = 3.85 times/yr/paper for all papers published. As corresponding author, papers have been published on Materials Today (Impact Factor/IF=21.695; 2 papers), Chem Mater (IF=9.466; 2 papers), Advanced Science (IF=9.034), J Mater Chem A (IF=8.867; 2 papers), Biomaterials (IF=8.402), ACS Appl Mater Interfaces (IF=7.504; 2 papers), Appl Energy (IF=7.182; 3 papers), Acta Biomaterialia (IF=6.319), Chem Comm (IF=6.319), Nanomed (IF=5.72), Biomacromolecules (IF=5.246), Adv Healthcare Mater (IF=5.11), J Mater Chem B (IF=4.872), Antimicrob Agents Chemother (IF=4.302), Int J Nanomed (IF=4.3; 5 papers), etc. Kang J, Dietz M, Hughes K, Xing M, Li B*. (2019). Silver nanoparticles present high intracellular and extracellular killing against Staphylococcus aureus. J Antimicrob Chemother (IF=5.217). doi: 10.1093/jac/dkz053. Zhang S, Xing M, Li B*. (2019). Capsule integrated polypeptide multilayer films for effective pH-responsive multiple drug co-delivery. ACS Appl Mater Interfaces (IF=8.097) (In press). Zhang S, Xing M, Li B*. (2019). Recent advances in musculoskeletal local drug delivery. Acta Biomaterialia (IF=6.319), https://doi.org/10.1016/j.actbio.2019.01.043. Hsu H, Khosrozadeh A, Li B, Luo G, Xing M, Zhong W*. An Eco-friendly, nanocellulose/RGO/in-situ formed polyaniline for flexible and free-standing supercapacitors. ACS Sustainable Chemistry & Engineering (IF=6.140). Doi: 10.1021/acssuschemeng.8b04947. Zhang S, Xing M, Li B*. (2018). Biomimetic layer-by-layer self-assembly of nanofilms, nanocoatings, and 3D scaffolds for tissue engineering. Int J Mol Sci (IF=3.687) 19:1641. Li B*, Webster TJ*. (2018). Bacteria antibiotic resistance: New challenges and opportunities for implant-associated orthopedic infections. J Orthop Res (IF=2.692). 36:22–32, 2018. DOI: 10.1002/jor.23656. [PDF]. Liu B, Wang Y, Miao Y, Zhang X, Fan Z, Singh G, Zhang X, Xu K, Li B, Hu Z*, Xing M*. (2018). Hydrogen bonds autonomously powered gelatin methacrylate hydrogels with super-elasticity, self-heal and underwater selfadhesion for sutureless skin and stomach surgery and E-skin. Biomaterials (IF=8.402) 171:83-96. [PDF]. Yan J, Liu X*, Li B, Yu J, Ding B*. (2018). Mixed ionic and electronic conductor for Li-metal anode protection. Adv Mater (IF=21.95). 30:1705105. DOI: 10.1002/adma.201705105. Li B*, Webster TJ*, editors (2018). Orthopedic Biomaterials (Volume 1) - Advances and Applications (20 chapters, 621 pages). Publisher: Springer. ISBN 978-3-319-73663-1, ISBN 978-3-319-73664-8 (eBook), https://doi.org/10.1007/978-3-319-73664-8. Li B*, Webster TJ*, editors (2018). Orthopedic Biomaterials (Volume 2) - Progress in Biological Materials and Industry Perspectives (18 chapters). Springer. ISBN 978-3-319-89541-3, ISBN 978-3-319-89542-0 (eBook), https://10.1007/978-3-319-89542-0, https://www.springer.com/us/book/9783319895413. Kang J, Hughes K, Xing M, Li B*. (2018). Orthopedic applications of silver and silver nanoparticles. In Book “Orthopaedic Biomaterials”. Ed. Li B and Webster TJ. Publisher: Springer, ISBN 978-3-319-73663-1, pages 63-84. Andreini DE, Werner ZJ, Bell CD, Xing M, Li B*. (2018). Peptides as orthopaedic biomaterials. In Book “Orthopaedic Biomaterials”. Ed. Li B and Webster TJ. Publisher: Springer, ISBN 978-3-319-73663-1, pages 247-274. Armstead AL, Simoes TA, Wang X, Brydson R, Brown A, Jiang BH, Rojanasakul Y, Li B*. (2017). Toxicity and oxidative stress response induced by nano- and micro-CoCrMo particles. J Mater Chem B (IF=4.543) 5:5648-57. DOI: 10.1039/C7TB01372H. [PDF]. KX Xu, Y Liu, SB Bu, T Wu, Q chang, G Singh, X Cao, C Deng, B Li, G Luo, M Xing. (2017). Egg albumen as a fast and strong medical adhesive glue. Adv Healthcare Mater (IF=5.11) 6(19):1700132. DOI: 10.1002/adhm.201700132. [PDF]. Cheng H, Yue K, Kazemzadeh-Narbat M, Liu Y, Khalilpour A, Li B, Zhang YS, Annabi N, Khademhosseini A*. (2017). Mussel-inspired multifunctional hydrogel coating for prevention of infections and enhanced osteogenesis. ACS Appl Mater Interfaces (IF=7.504) 9:11428-39. [PDF]. Zhuang Q*, Clements B, Li B. (2017). Emerging new types of absorbents for post-combustion carbon capture, In Book “Recent Advances in Carbon Capture and Storage”, Ed. Yongseung Yun. ISBN 978-953-51-3006-2, Print ISBN 978-953-51-3005-5. Publisher: InTech, published March 08, 2017. DOI: 10.5772/62966. P.91-116. [PDF]. Li B*, Wang X, Hopkinson D, Hoffman J, Egbebi A, Resnik K. Non-provisional patent application, May 2017. Wang Q, Yan J, Yang J, Li B*. (2016). Nanomaterials promise better bone repair. Materials Today (IF=21.695). 19(8):451-63. DOI: doi:10.1016/j.mattod.2015.12.003. [PDF]. Armstead AL, Li B*. (2016). In vitro inflammatory effects of hard metal (WC-Co) nanoparticle exposure. Int J Nanomed (IF=4.3) 11:6195-206. [PDF]. [Supplementary Materials]. Armstead AL, Li B*. (2016). Nano-toxicity: Emerging concerns regarding nanomaterial safety and occupational hard metal (WC-Co) nanoparticle exposure. Int J Nanomed (IF=4.3) 11:6421-33. [PDF]. Wang X, Akhmedov NG, Hopkinson D, Hoffman J, Duan Y, Egbebi A, Resnik K, B Li*. (2016). Phase change amino acid salt separates into CO2-rich and CO2-lean phases upon interacting with CO2. Appl Energy(IF=7.182) 161:41-7. [PDF]. Yan J, Liu X, Li B*. (2016). Capacity fade analysis of sulfur cathodes in lithium sulfur batteries. Advanced Science (IF=9.034) 3(12):1600101. doi:10.1002/advs.201600101. [PDF]. Yan J, Li B, Liu X*. Open structures in substrates for high sulfur loading Li-S battery (Application # 748). Provisional patent application to USPTO, November 2016. Li B*, Wang X, Hopkinson D, Hoffman J, Egbebi A, Resnik K. Provisional patent disclosure, June 2016. Yan J, Li B, Liu X*. Multilayered sulfur composite cathodes for lithium sulfur batteries. US patent20160172667 A1. Date of application: June 16, 2016. Armstead AL, Minarchick VC, Porter DW, Nurkiewicz TR, Li B*. (2015). Acute inflammatory responses of nanoparticles in an intra-tracheal instillation rat model. PLOS ONE (IF=2.806) 10(3):e0118778. DOI:10.1371/journal.pone.0118778. PMID25738830, PMC4349695. [PDF]. Wang X, Chen YC, Li B*. (2015). Aligning 3D nanofibrous networks from self-assembled phenylalanine nanofibers. RSC Advances (IF=3.108) 5:8022-7. PMID25621167, PMC4303580. [PDF]. Liu LZ, Ding M, Zheng JZ, Zhu Y, Fenderson BA, Li B, Yu JJ, Jiang BH*. (2015). Tungsten carbide-cobalt nanoparticles induce reactive oxygen species, AKT, ERK, AP-1, NF-κB, VEGF, and angiogenesis. Biol Trace Elem Res (IF=2.399) 16:57-65. DOI: 10.1007/s12011-015-0331-6. [PDF]. Huang H, Chen AY, Ye X, Li B, Rojanasakul Y, Rankin GO, Chen YC*. (2015). Myricetin inhibits proliferation of cisplatin-resistant cancer cells through a p53-dependent apoptotic pathway. Int J Oncol (IF=3.079) 47:1494-02. DOI: 10.3892/ijo.2015.3133. [PDF]. Chen X, Jiang B, Hamza T, Li B. (2015). Nanoparticles targeting to osteoblasts for potential intracellular pathogen elimination. J Control Release (IF=7.786), 213:e10-1. Yan J, Li B, Liu X*. (2015). Nano-porous sulfur-polyaniline electrodes for lithium-sulfur batteries. Nano Energy (IF=12.343) 18:245-52. DOI: 10.1016/j.nanoen.2015.10.024. [PDF]. Yan J, Liu X, Yao M, Wang X, Wafle T, Li B*. (2015). Long-life, high-efficiency lithium-sulfur battery from nano-assembled cathode. Chem Mater (IF=9.466) 27:5080-7. DOI: 10.1021/acs.chemmater.5b01780. [PDF]. Yan J, Liu X, Qi H, Li W, Zhou Y, Yao M, Li B*. (2015). High-performance lithium-sulfur batteries with a cost-effective carbon paper electrode and high sulfur-loading. Chem Mater (IF=9.466) 27:6394-401. DOI: 10.1021/acs.chemmater.5b02533. [PDF]. Yan J, Liu X, Wang X, Li B*. (2015). Long-life, high-efficiency lithium/sulfur batteries from sulfurized carbon nanotube cathodes. Journal of Materials Chemistry A (IF=8.867) 3:10127-33. [PDF]. Yan J, Liu X, Li B*. (2015). Nano-assembled Na2FePO4F/carbon nanotube multi-layered cathodes for Na-ion batteries. Electrochemistry Communications (IF=4.396) 56:46-50. [PDF]. Wang X, Akhmedov NG, Duan Y, Li B*. (2015). Nuclear Magnetic Resonance studies of CO2 absorption and desorption in aqueous sodium salt of alanine. Energy & Fuel (IF=3.091) 29:3780-4. [PDF]. Duan Y*, Lekse J, Wang X, Li B, Alcántar-Vázquez B, Pfeiffer H, Halley JW. (2015). Electronic structural, phonon dynamic properties and CO2 capture capabilities of Na2-αMαZrO3 (M=Li, K, α=0.0, 0.5, 1.0, 1.5, 2.0): First-principles density functional theory investigations and experimental validations. Physical Review Applied (IF=4.808) 3:044013. [PDF]. Wang X, Li B*. (2015). Phase-change solvents for CO2 capture. In Book “Novel Materials for Carbon Dioxide Mitigation Technology (ISBN 9780444632593).” Fan S and Morreale B, Eds. Elsevier. P.3-22. DOI: http://dx.doi.org/10.1016/B978-0-444-63259-3.00001-X or http://www.sciencedirect.com/science/article/pii/B978044463259300001X. [PDF]. Dr. Li’s trainee, Austin Paul-Orecchio, was selected to present his summer research at the 15th Undergraduate Research Day at the Capitol, Charleston, WV, Feb. 16, 2018. Dr. Li’s trainee, Shichao Zhang, was awarded a Travel Grant of $500 from the Office of Research and Graduate Education, School of Medicine, West Virginia University. April 2018. Orthopaedics’ Li invited as senior editor of special issue on antimicrobials and anticancers. Website: https://enews.wvu.edu/articles/2018/12/13/orthopaedics-li-invited-as-senior-editor-of-special-issue-on-antimicrobials-and-anticancers. Li in Orthopaedics Invited as Keynote Speaker at 2019 European Cells and Materials Annual Conference: As a well-respected scientist in the field of infection, Dr. Bingyun Li at WVU has been invited to give a keynote lecture on “Immunotherapeutic approaches against infection” at the 2019 European Cells and Materials Annual Conference. The conference will be held during June 26-28, 2019 at the Congress Center, Davos, Switzerland. The focus of the 2019 eCM conference will be on Orthopedic Infection. Website: https://enews.wvu.edu/articles/2018/11/19/li-in-orthopaedics-invited-as-keynote-speaker-at-2019-european-cells-and-materials-annual-conference. Researchers in Orthopaedics accepted to present at the 2019 ORS annual meeting: Research work at WVU titled “Capsule Integrated Polypeptide Films Deliver Various Drugs On-Demand” has been accepted as a podium presentation to be presented at the 2019 Orthopaedic Research Society Annual Meeting. This abstract is authored by Shichao Zhang, a postdoctoral research associate at Professor Li’s lab in Orthopaedics. A second abstract in Professor Li’s lab has been accepted as a poster presentation, and this abstract is co-authored by Jason Kang, a graduate student of the Clinical and Translational Science program at WVCTSI, and Frederik Brønsted, a WV INBRE student from West Virginia Wesleyan. Website: https://enews.wvu.edu/articles/2018/11/19/researchers-in-orthopaedics-accepted-to-present-at-the-2019-ors-annual-meeting. WVU-led research team to study turning carbon dioxide from power plants into valuable products: Research led by Professor Li at WVU will focus on turning carbon dioxide in power plant flue gas into innovative new nanomaterials aiming to lower the cost of carbon capture technology. Website: https://wvutoday.wvu.edu/stories/2018/11/15/wvu-led-research-team-to-study-turning-carbon-dioxide-from-power-plants-into-valuable-products. Li to serve as associate editor of a prestigious microbiology journal: Professor Li in WVU Orthopedics has been invited to serve as an Associate Editor of Frontiers in Microbiology (Specialty section: Antimicrobials, Resistance and Chemotherapy), which is a prestigious open access microbiology journal. Website: https://enews.wvu.edu/articles/2018/08/30/li-to-serve-as-associate-editor-of-a-prestigious-microbiology-journal. Li publishes second book on orthopedic biomaterials: Following publishing his first book – Orthopedic Biomaterials: Advances and Applications in March 2018, Professor Li published his second book this month. This second book – Orthopedic Biomaterials: Progress in Biology, Manufacturing, and Industry Perspectives – has 18 chapters, offers strong input from clinicians as well as those in industry and academia, and emphasizes the roles of manufacturing and biology in biomaterial properties. Website: https://enews.wvu.edu/articles/2018/08/29/li-publishes-second-book-on-orthopedic-biomaterials. Researcher in orthopaedics awarded DoD grants to improve trauma patient care: Professor Li in WVU Orthopaedics has been awarded $600,000 to develop new therapeutic approaches to improve the surgical treatments of open fracture patients. Website: https://enews.wvu.edu/articles/2018/08/28/researcher-in-orthopaedics-awarded-dod-grants-to-improve-trauma-patient-care. Li in publishes new book on orthopedic biomaterials: The book Orthopedic Biomaterials: Advances and Applications edited by Professor Li in Department of Orthopaedics highlights recent advances in orthopaedic biomaterials. It is one of only a few books including contributions from clinicians, industry, and academia to provide a truly comprehensive look at bone implants. Website: https://enews.wvu.edu/articles/2018/04/03/li-in-publishes-new-book-on-orthopedic-biomaterials. Bingyun Li from WVU Orthopaedics has been selected as part of a team to receive an Interdisciplinary Translational Project Team award from the Center for Dental, Oral, Craniofacial Tissue and Organ Regeneration. The project is about 3D-printed nanoclay enhanced biomaterials. Website: https://enews.wvu.edu/articles/2019/01/22/researcher-awarded-grant-from-center-for-dental-oral-craniofacial-tissue-and-organ-regeneration. Dr. Li serves as the Topic Chair of the Infection and Inflammation, Orthopaedic Research Society Program Committee (2017-2018). Dr. Li was invited to co-chair the NIH Study Section (teleconference) - BST-M (55): Bioengineering Research Partnerships (U01), April 4, 2017. Dr. Li’s trainee, Jason Kang (master student), received the First Place Poster Prize in the master graduate category at the Van Liere Research Day, Morgantown, WV, March 2017. Dr. Li was awarded a Travel Grant, WVU, March 2017. Congratulations to Jianhua Yan, PhD (PhD student)! Jianhua accepted an offer from Donghua University in China as a full professor, February 2017. Dr. Li’s trainee, Elijah Roberts, was selected to present a poster at the Undergraduate Research Day at the Capitol, Charleston, WV, Feb. 24, 2017. Dr. Li was invited to serve as the Chair of the Infection and Inflammation Topic Committee in the Orthopaedic Research Society. November 15, 2016. Dr. Li and his colleagues (Brock Lindsey, MD and Matthew Dietz, MD) are featured as outstanding collaborators in the Department of Orthopaedics in the August issue of the Office of Research and Graduate Education of the WVU Health Sciences Center. August 2016. Dr. Li was nominated for the Dean’s Awards for Excellence in research, WVU, July 2016. Dr. Li was selected as a CTSI Scholar Mentor of a WV CTSI Research Scholar, July 2016-June 2017. Dr. Li was invited by the Chair of the Scientific Program to chair the “Anti-infective biomaterials and device related infections” session at the 10th World Biomaterials Congress (WBC2016), Montreal, Canada, May 18, 2016. Dr. Li was nominated for the Vice President’s Outstanding Achievement in Research and Scholarly Activities Award at Health Sciences Center, WVU. Dr. Li received the International Travel Award from WVU to attend the 10th World Biomaterials Congress, Montreal, Canada, March 2016. On behalf of Dr. Xingbo Liu, lead of the Electrochemical Systems Research Center, Dr. Li was named, among six researchers (Cheryl Ball, digital publishing; Dan Carder, diesel emissions research; Sally Hodder, clinical and translational sciences; Bingyun Li, electrochemical systems research; Maura McLaughlin, neutron stars and NANOGrav; Sean McWilliams, LIGO and gravitational waves) as Outstanding Researchers at President E. Gordon Gee’s special State of the University address in celebrating the University's highest designation of Carnegie Classification of Institutions of Higher Education, March 1, 2016. Dr. Li’s collaborative work with Xingbo Liu and Trina Wafle was picked as one of the Crowd Choice Awards for Audience Favorites in Pitch Session 3 at the 2015 TransTech Energy (TTE) Business Development Conference, Morgantown, WV, November 2015. Dr. Li’s PhD student (engineering), Jianhua Yan, was awarded the National Merit Scholarship from the Office of Educational Affairs of the Embassy of PR China in USA, November 2015. Dr. Li’s PhD student, Jianhua Yan, was awarded a Doctoral Student Travel Award from the School of Engineering, WVU for the Electrochemical Society (ECS) 228th meeting, Oct. 10-15, 2015, Phoenix, AZ. One of Dr. Li’s trained residents, Andrew Hanselman, MD, was awarded a Resident Research Grant from Orthopaedic Research and Education Foundation (OREF), June 2015. Dr. Li’s PhD student, Jianhua Yan, was awarded a Travel Grant from the national Electrochemical Society (ECS) for the ECS 227th meeting, May 24-28, Chicago, IL. Dr. Li’s PhD student, Jianhua Yan, was awarded a Doctoral Student Travel Award from School of Engineering, WVU, March 2015. Dr. Li was included in the 70th Platinum Anniversary Edition of Marquis Who's Who in America. Dr. Li was invited by the program chair to serve as a moderator of a Spotlight Session titled “Knee OA Repair.” ORS Annual Meeting, Las Vegas, NV, March 28-31, 2015.Our paper titled “Advances in CO2 capture technology” received the “Applied Energy Highly Cited Award” with a certificate, March 2015. The award was selected by the Editor-in-Chief and the Publisher as one (represents only 1.75% of papers in the journal during 2012–2013) of the most highly-cited papers published in the Applied Energy journal in 2012–2013. Elias Joseph (MD student) received the Second Place MD Poster Prize at the Van Liere Research Day, Morgantown, WV, February 2015. Congratulations to Xianfeng Wang, PhD (postdoc)! Xianfeng accepted an offer from Donghua University in China as a full professor, December 2014. Congratulations to Andrea Armstead (PhD student)! Andrea accepted a job offer as an application scientist from a biotech company at Boston, December 2014. Congratulations to Andrea Armstead! Andrea successfully defended her PhD dissertation titled "Understanding the Mechanism of Hard Metal (WC-Co) Toxicity: In vitro Studies and In vivo Exploration," October 2014. Welcome Qifei Wang, visiting MD/PhD graduate student (11/2014-11/2015), the first affiliated hospital of Sun Yat-Sen University, Guangzhou, China. Welcome Fengfeng Wu, MD, visiting orthopaedic physician (10/2014-12/2014), Huzhou Central Hospital, Zhejiang, China. Congratulations to Andrea Armstead! Andrea was awarded Graduate Student Outstanding Achievement Award, School of Pharmacy, West Virginia University, April 2014. Dr. Li was invited to lecture as a faculty at an international orthopaedic conference: Dr. Li gave three invited presentations at the 2013 Combined Conference of the Fifth Asia Pacific Orthopaedic Association (APOA) Infection Section Scientific Meeting, Ninth Asia Pacific Spine Society Congress and Ninth APOA Paediatric Section Congress, August, Kuching, Malaysia. Dr. Li has been invited to give lectures at similar clinics-focused international orthopaedic conferences several times since 2010. Our paper titled "Biomimetic electrospun nanofibrous structures for tissue engineering" has been published and featured on Materials Today, August 2013. Dr. Li was the Invited Speaker at the 2013 Student Night of the American Institute of Chemical Engineers (AIChE)-Pittsburgh Section, Feb. 12, 2013. Andrea Armstead received the Second Place 2009 PhD Student Poster Prize at the Van Liere Research Day, Morgantown, WV, February 2013. Peter Farjo (MD student) received the First Place MD Poster Prize at the Van Liere Research Day, Morgantown, WV, February 2013. Congratulations to Therwa Hamza (PhD student)! Therwa accepted a postdoc position from University of Maryland, December 2014. Congratulations to Therwa Hamza! Therwa successfully defended her PhD dissertation titled "Infection Models of Intracellular Staphylococcus aureus and The Impact of Interleukin 12 on Macrophage Killing Activity," December 2014. Congratulations to Bingbing Jiang, PhD (postdoc)! Bingbing accepted an offer from Hubei University in China as a full professor, June 2012. Dr. Li was an Invited Speaker at the International Forum of Biomedical Materials: Nanobiomaterials for Tissue Regeneration, Hangzhou, Zhejiang, China, May 2012. Student Award: Christopher Arena (MD student) received the First Place MD Poster Prize at the Van Liere Research Day, Morgantown, WV, March 2012. 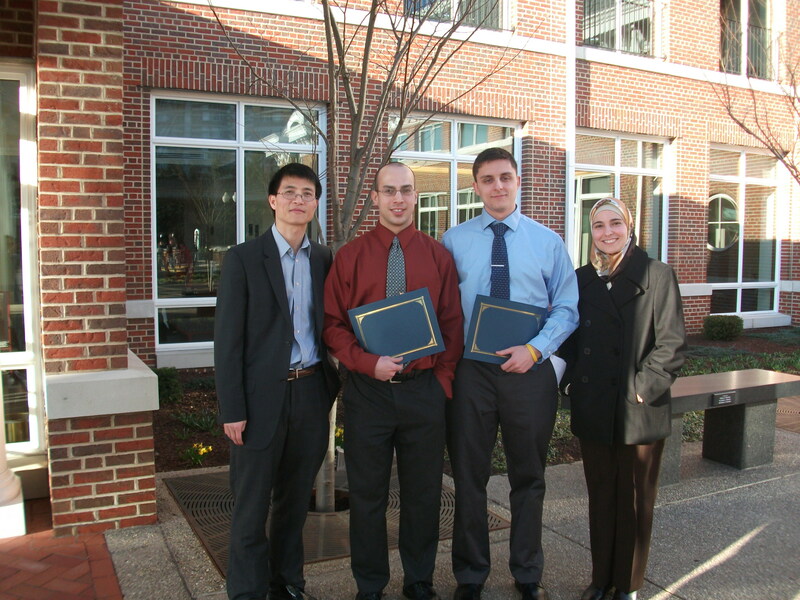 Student Award: John Amoroso (MD student) received the Second Place MD Poster Prize at the Van Liere Research Day, Morgantown, WV, March 2012. 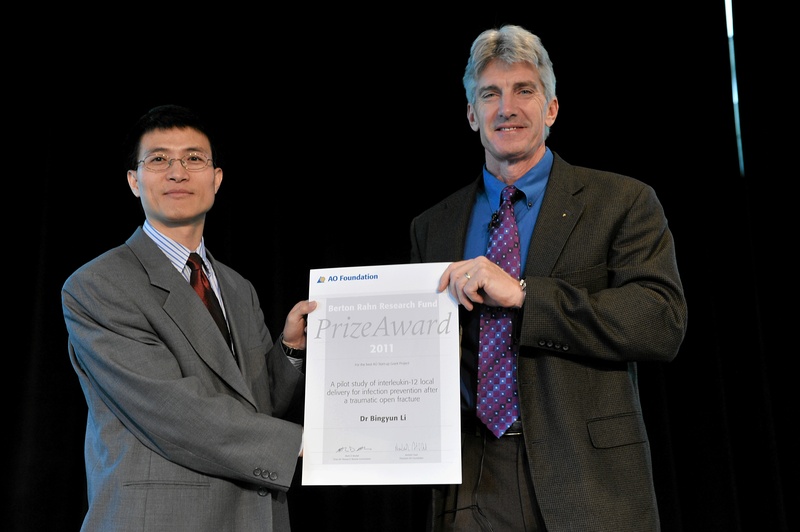 Dr. Li received international recognitions of his dedication and achievements in research. Dr. Li has been awarded the Berton Rahn Prize from the AO Foundation for his study of interleukin-12 local delivery for infection prevention after a traumatic open fracture. This prize, which honors the best completed project funded by the AO Foundation, includes a monetary award and an invited presentation at the AO trustees meeting in Berlin in July 2011. The AO foundational is one of the best international orthopaedic foundations and is a medically guided international nonprofit foundation funding work on trauma and musculoskeletal surgery. This event is featured at WVU Research Highlights. Andrea Armstead (PhD student) awarded a 2nd WVNano Graduate Fellowship, August 2011. Dr. Li gave an invited presentation at the Osteosynthesis and Trauma Care (OTC) Foundation’s Leadership Forum, June 2011, Madrid, Spain. The OTC Foundation promotes innovation and advancement in Osteosynthesis, Traumatology and Patient Care. 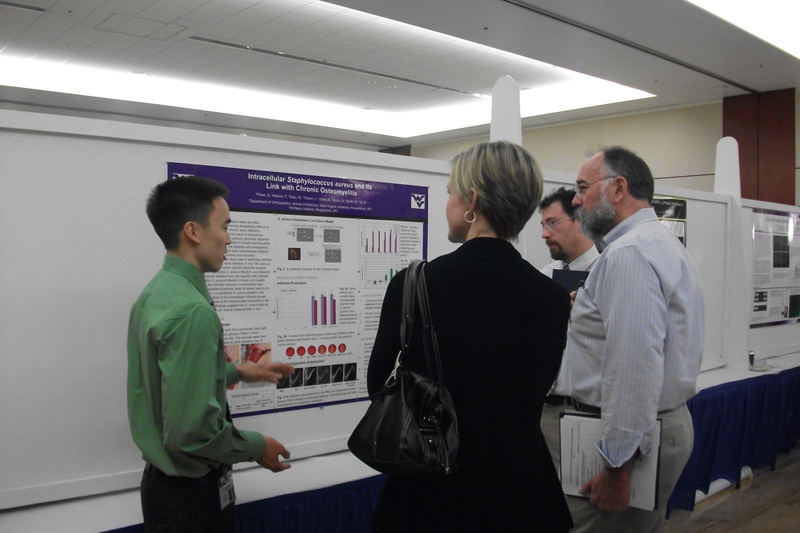 Student Award: Danh Pham (MD student) received the Second Place MD Poster Prize at the Van Liere Research Day, Morgantown, WV, April 2011. Andrea Armstead (PhD student) awarded a WVNano Graduate Fellowship, August 2010. Therwa Hamza (PhD student) was awarded Student Travel Award from the COST865 2010 Training School to attend the Early Stage Researcher Training Program on Bioencapsulation. Dijon, France, June 29 - July 2, 2010. Student Award: Steven Regal (MD student) received the First Place MD Poster Prize at the Van Liere Research Day, Morgantown, WV, April 2010. Andrea Armstead (PhD student): WVNano Graduate Research Fellowship ($27,000/year; 08/2010 – 08/2012). Adly Noore (Pre-Med student): NASA EPSCoR Undergraduate Research Fellowship. 5/16/2010 – 5/15/2011. Adly Noore (Pre-Med student): WVNano SURE Fellowship, 6/1/2010 – 7/29/2010. Dr. Li's Graduate Students Go Global: Summer Research Tour in China. 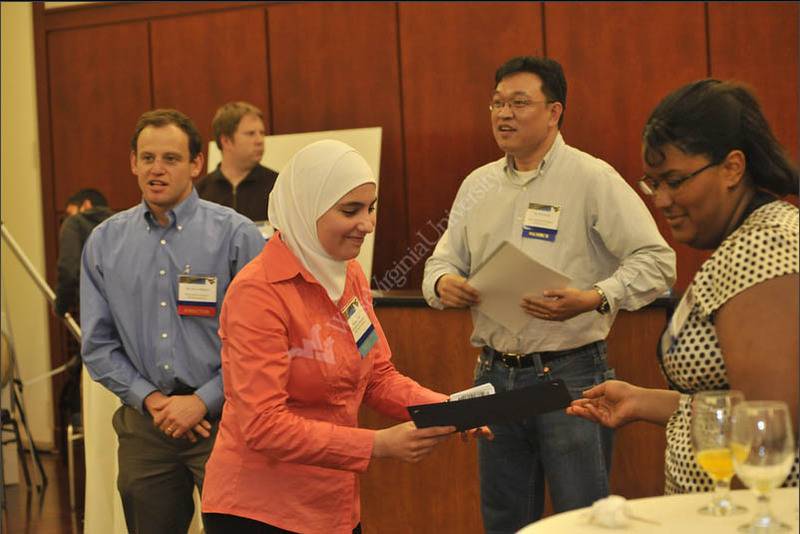 Student Award: Therwa Hamza (PhD student) received the Best Graduate Student Poster Prize at the WVNano Research Symposium, Morgantown, WV, May 2009. Stephanie Knittle (undergraduate): WVNano SURE Fellowship, 6/8/2009 – 7/31/2009. Steven Regal (MD student): Van Liere Research Fellowship, 6/08/2009-7/31/2009. Our research was highlighted in the following news: WVU Team Develops Innovative Anti-Infection Technology. Elizabeth DeFusco (undergraduate): NASA EPSCoR Undergraduate Research Fellowship. 5/16/2008 – 5/15/2009. Stephanie Knittle (undergraduate): WVNano SURE Fellowship, 6/2/2008 – 7/25/2008. Elizabeth DeFusco (undergraduate): WVNano SURE Fellowship, 6/2/2008 – 7/25/2008. Invited Speaker & Panelist @ Nanomedicine event: http://www.nvtc.org/events/geteventinfo.php?event=COOLT-3. Heather Ogle (undergraduate): NASA EPSCoR Undergraduate Research Fellowship. 5/16/2007 – 5/15/2008. Michael Hagar (MD student): Van Liere Research Fellowship, 6/08/2007-7/31/2007. Brian Kellermeyer (MD student): Van Liere Research Fellowship, 6/08/2007-7/31/2007. 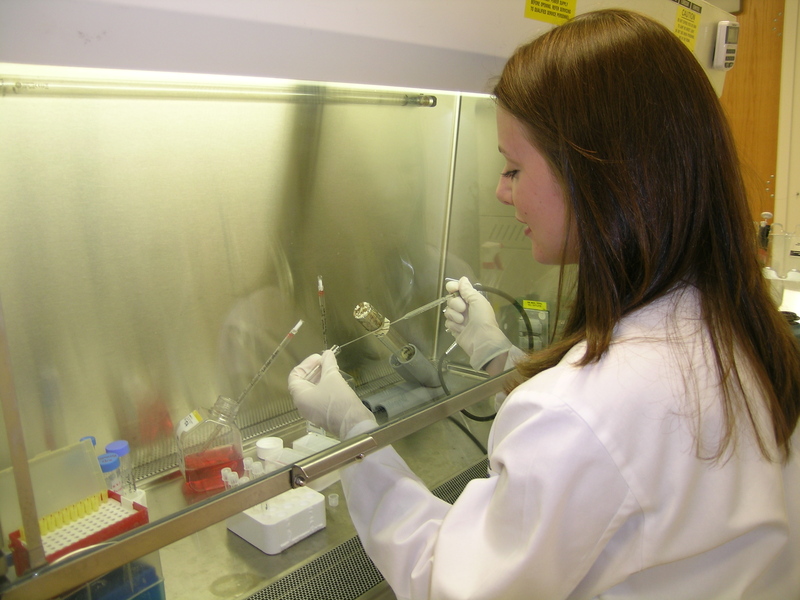 Elizabeth DeFusco (undergraduate): WVNano SURE Fellowship, 6/2/2007 – 7/25/2007. Our research was highlighted in the following news: NETL Joins Forces with Medical School to Develop CO2 Sorbents. Rajiv Bhattarai (undergraduate): Spurlock/McClung Research Fellowship. 5/30/2006 – 8/4/2006. Postdoc and graduate positions are occasionally available, please email bili@hsc.wvu.edu for availability. Joined graduate trainings and self-funded visiting students and other scholars are welcome. Dr. Li has mentored 101 trainees including research residents, PhD students, master's student, MD students, undergraduates, high school student, postdoctoral research associates, and visiting scholars.